Spring has sprung… I am trying very hard to ignore the fact that it is still so cold outside. But alas we have crossed the threshold of the Spring equinox. I don’t know about you, but I am itching to get into my garden. We purchased a new home late last summer. This will be my first gardening season in this house. 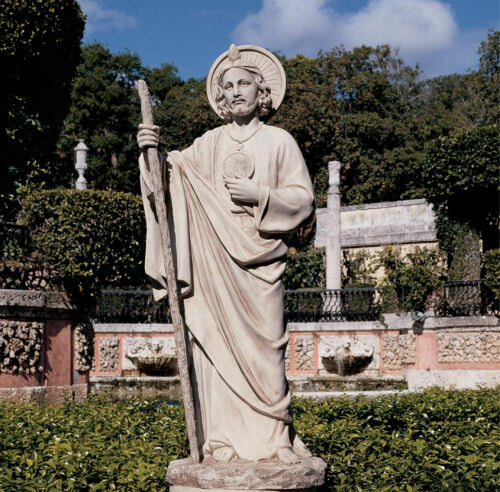 Following our theme of a blog post about a Saint each week of March, I thought I would share some Patron Saints that might just bring good blessings to your garden… whether it be veggie or flower. Patron Saint of the garden’s birds and animals and of ecology. 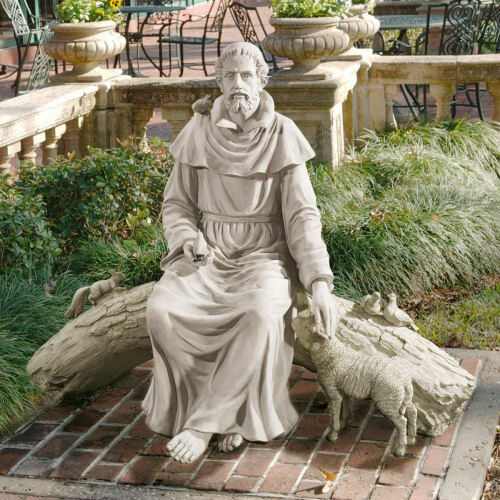 Founder of the Franciscans, he is often shown preaching to the birds.In Nature’s Sanctuary Saint Francis Garden Sculpture will be a religious and nature focal point will leave your guests in awe! Saint Francis rises over three feet high on his generous, four-foot-long log perch. This Italian patron saint of nature reaches toward the gentle lamb at his feet, showcasing amazing detail from the folds of his garment to his benevolent expression. The artist captures intricacies sometimes lost in sculpts this grand in scale, casting our exclusive in quality designer resin as an heirloom for decades to come. Our Saint Therese of Lisieux Therese Martin statue is a sculpted likeness of this beloved woman. She was cured from an illness at age 8 when a statue of the Blessed Virgin smiled at her. Many lives have been touched by her intercession. Prior to her death, she vowed, to “Spend my heaven doing good on earth. I will let fall a shower of roses .” For this she is the Patron Saint of Florists. Her roses continue to fall everywhere in the world to those who pray for her intercession. Saint Therese Statue would make a beautiful addition to any rose garden. Saint Fiacre Garden Sculpture is made of cast stone and is wonderful for the home or garden. Saint Fiacre was born in Ireland and raised in a monastery. Much of mankind learning and knowledge was brought to the monasteries and left in the care and protection of the monks. Travelers brought seeds and plant material, as well as cultural enlightenment from as far away as Rome and the Holy Land. Saint. Fiacres days at the monastery taught him a deep love of silence, the joys of planting and harvesting crops and an appreciation of nature. Drawn to the religious life and the desire to serve God in solitude, Fiacre decided to establish a hermitage for worship. Monks in those days were regarded as physicians of the body as well as the soul. Soon people were flocking to Fiacre for prayers, food and healing. He fed the hungry and healed the sick with herbs from his garden and prayed for all who came there. From his work be became Patron Saint of vegetable Garden and men who like to garden. Our spiritual garden figurine of Saint Fiacre is cast in cast stone to add a meditative and miraculous presence to your own Eden. Another quality Statue.com religious garden statue! Be sure to head on over to our website to view our fine gallery of sculptures, fountains and garden accessories.If you have something in mind but cannot find it on the website, feel free to contact us. Our excellent products coupled with our outstanding customer service ensures Statue.com is the best business for statuary and other fine goods. Have you seen the statue memes floating around on the internet? We have a few pinned on our Pinterest page. In case you are not familiar with a ‘meme,’ in this instance it takes the form of an image that is usually humorous and is viral on the internet. Honestly, I love a good meme. I might even be addicted. What is not to love about a lighthearted chuckle? In addition to the hilarity, they are really fun to create. Check out The David’s awesome sun glasses and surfboard. He is ready for a day at the beach. While these images are all in good fun, it is important to remember the artistry behind the actual sculptures. Sculptors of all different ages poured their souls into their creations. They were artistic geniuses of their time. A good laugh is always nice but we do take their artistic creations seriously. The heart and soul of the sculptor’s vision is what Statue.com is all about. We would never want to belittle that. So, we love a good laugh but we equally love the meaning behind the statuary. Like everything in life there needs to be a good balance. 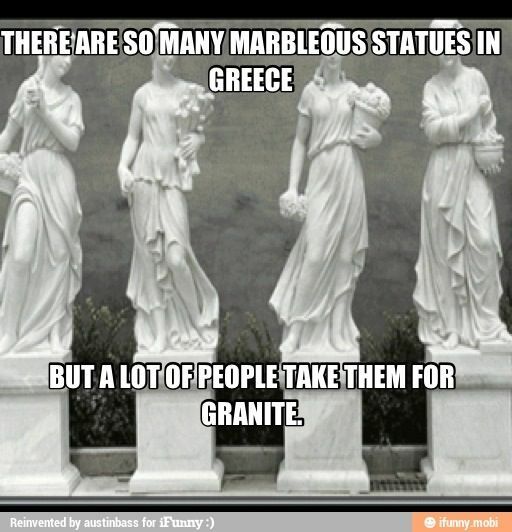 What do you think: statue memes funny or do they undermine the artistic genius? Ever feel like there is just no hope? Well, Saint Jude, Patron Saint of Lost Causes is your man. The Church recognizes St. Jude as the Patron Saint of Lost Causes because he urged his followers to persevere through hardship, just as their forefathers had done before them. Ever wonder about St. Jude iconography depicted by our statuary? St. Jude is often holding an image of Jesus in his hand or close to his heart. This can attributed to being one of Jesus’ Twelve Apostles. He is also depicted with a flame over his head. This represents his presence at the Pentecost, when he is said to have received the Holy Spirit, along with the other Apostles. In other sculptures he is seen holding a staff or club. Saint Jude sculptures make a lovely addition to any church, prayer garden or meditation spot. Whether it lends its calming or a special meditative presence to your garden or spiritual, indoors or outdoors, you won’t find a more moving image than our highly detailed St. Jude sculptures. We hope you take time to browse our extensive religious gallery. Head on over to our website to view our fine gallery of sculptures, fountains and garden accessories. Saint Patrick was born in Scotland around year 387. The area for which Saint Patrick grew up in was ruled by the Roman military. As a teenager he was captured by a raiding party and forced into slavery. He was taken to Ireland to tend to sheep as a Shepard. He learned the language and traditions of his captors. Ireland at this time was comprised of Druids and Pagans. It is also during this time Saint Patrick turned to God and prayer. His captivity lasted until his early twenties, where he had a dream about escaping and returning to his family. He acted out on this dream and eventually reunited with his family. Back in Scotland, Saint Patrick studied to become a priest. He would later return to Ireland to build churches and reform the people of Ireland. He used the famous shamrock to explain the Holy Trinity. The shamrock has been associated with him and Ireland since this time. We hope you enjoyed this tidbit of Saint Patrick. Stay tuned for next week’s Saint installment of the blog. 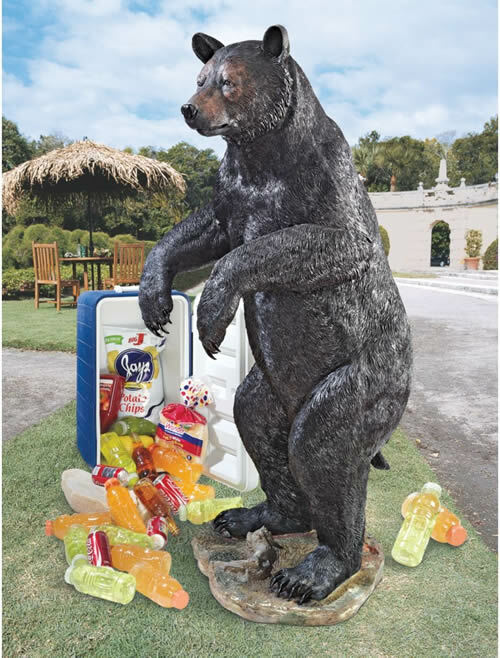 In the meantime, head on over to our website to view our fine gallery of sculptures, fountains and garden accessories. In honor of Saint Patrick’s day, the Lenten season, and of course our Saint (and religious) Sale, we are going to devote one blog to a saint each week through the month of March. Which Saints would you like to read about on our blog? We will try to honor your request. For now we will leave you with some fun facts about the saints we have pictured. Saint Ann was grandmother to Jesus Christ. Because of this she is usually depicted teaching a child. This lovely statue makes a wonderful gift for Grandmothers and teachers alike! Saint Francis had a profound love for nature and animals. He believed nature was a mirror of God. Saint Francis is almost always depicted with birds, squirrels and other friends of the forest. The Apostle Saint Jude Thaddeus is The Miraculous Saint, the Catholic Patron Saint of lost causes and cases despaired. When all other avenues are closed, he is the one to call upon, and his help often comes at the last moment. Dressed in Biblical era clothing for he was one of the Disciples of Jesus. He is distinguished by the fact that he often wears and holds a golden metal pendant of the type carried by people seeking his aid. Additionally, in some images of Saint Jude, there is a small flame atop his head, signifying the Baptism by Fire, also known as the Baptism of the Holy Ghost, which was received by the Disciples of Jesus at Pentecost. Stay tuned for more interesting information on saints. 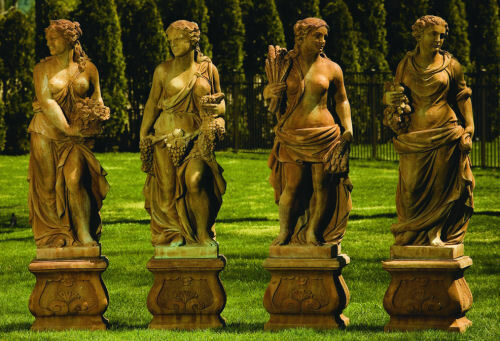 In the meantime, head on over to our website to view our fine gallery of sculptures, fountains and garden accessories.